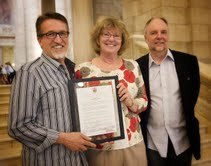 On Tuesday, May 7, Steve and his manager Dave were invited to the Manitoba Legislative Building where, before the assembly, Erna Braun (MLA for Rossmere) warmly read the following Member’s Statement honouring Steve’s work over the past several decades. Mr. Speaker, I would like to acknowledge and to congratulate a talented local musician, Steve Bell. Steve Bell is a faith-based singer-songwriter whose work has received critical acclaim across the world. This April, Steve was recognized by the Winnipeg Symphony Orchestra’s prestigious Golden Baton Award for his outstanding contribution to the musical life of Winnipeg. Steve’s family relocated to Manitoba and it was here in Winnipeg that Steve began to work as a musician full time. He is well known and well regarded throughout our music community. Steve’s music is a reflection of his own personal jouney and his honest stories resonate with vast audiences. His 17 albums have sold over 300,000 copies and he has performed more than 1,500 concerts across the world. Talent, passion and dedication have led him to win many accolades including two JUNOs, multiple Prairie Music, Western Canada Music and Covenant Awards as well as the Queen’s Diamond Jubilee Medal. For Steve, family is very important. Steve and his wife Nanci have three grown children, Sarah, Jesse, Micah and a foster daughter, Kendara. Steve has also been an advocate and fundraiser for the Canadian Foodgrains Bank, World Vision and Compassion Canada. Mr. Speaker, Steve Bell is an inspirational musician whose compelling performance and thoughtful music helps to bring people together. He joins us today in the gallery and I ask all members present to join me in congratulating Steve on all his outstanding achievements and to wish him and his family continued success. what a blessing to see where God has taken you and to see the impact that He is making through you. You are a wonderfully gifted musician and a fantastic friend! I remember when I first met you at 11 years old and I have since thoroughly enjoyed every concert and every visit that we’ve had.